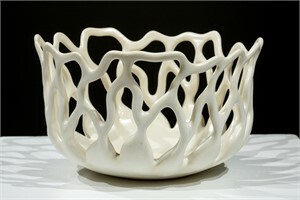 I strive to create original dynamic works that test the boundaries of how pottery should look. 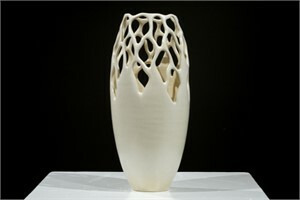 Ethan's ceramics remind the viewer of organic forms, revered architecture, modern minimalist design. He is inspired by the repetitive yet chaotic poetry of a coral reef, the soaring buttressing of of Medieval cathedrals, and the bold lines of modern art. His clay vessels are thrown on a potter's wheel, carved with a fine blade and fired. Each piece is glazed with an airbrush to ensure a smooth even finish before firing for a second time. What we love: Light filtering through each vessel creates yet another sculpture in shadow. 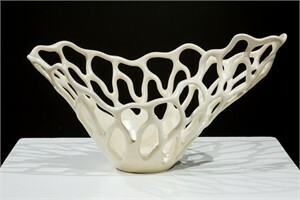 Artist Statement: I strive to create original dynamic works that test the boundaries of how pottery should look. 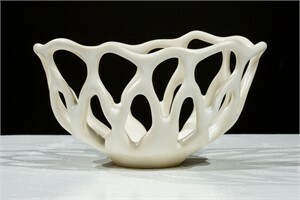 About: Ethan's ceramics remind the viewer of organic forms, revered architecture, modern minimalist design. He is inspired by the repetitive yet chaotic poetry of a coral reef, the soaring buttressing of of Medieval cathedrals, and the bold lines of modern art. 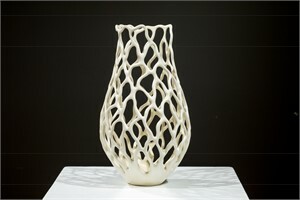 Process: His clay vessels are thrown on a potter's wheel, carved with a fine blade and fired. Each piece is glazed with an airbrush to ensure a smooth even finish before firing for a second time. 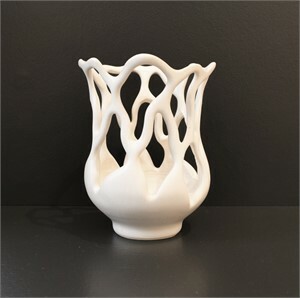 What we love: Light filtering through each vessel creates yet another sculpture in shadow.